We’d love your help. Let us know what’s wrong with this preview of Bright Blaze of Magic by Jennifer Estep. To ask other readers questions about Bright Blaze of Magic, please sign up. Note: some spoilers for earlier books in this series. The hair-raising adventures of Lila Merriweather conclude in Bright Blaze of Magic, the third volume of Jennifer Estep’s BLACK BLADE young adult urban fantasy series. Lila, age seventeen, is not only a highly skilled thief, but also has amazing sword-fighting abilities and extraordinary magical powers, not to mention championship snarking abilities. In the town of Cloudburst Falls, where magical power is so prevalent that the town attracts tourists who want to see magical people and creatures, people’s magical strength lends itself to political power. Lila is a bodyguard for the Sinclair Family, particularly the son and heir of the family, Devon Sinclair. Since the first book, Cold Burn of Magic, the feud between the Sinclairs and their bitter rivals, the Draconi Family, has been heating up. Now the conflict threatens to explode: Victor Draconi, the evil head of the Draconis, has been stockpiling magical swords and is almost ready to take over the town and stamp out all of the competing Families. At the end of the second book, Dark Heart of Magic, Lila and her friends, Devon Sinclair and Felix Morales, discovered the magical swords in a hidden room in the Draconi castle. Using Lila’s talent for burglary and their friendship with Deah Draconi, Victor’s daughter, they’re now sneaking into the castle and replacing most of the magical swords with ordinary swords. But Victor’s army is so large that just stealing these swords isn’t going to be enough to neutralize the deadly threat that the Draconi Family presents to the other magical families. When Victor and his son Blake suddenly make their move, many people are murdered or captured by the Draconis. Lila and her friends escape and go into hiding, unable to compete head-to-head with the far superior forces that the Draconis command. It seems that Victor holds all the cards … but has he underestimated Lila? Lila dashes from one dangerous situation to another in this fast-paced tale, leading her friends into and out of hazards. Burglary, swordfights, infiltrations of enemy territory, encounters with copper crushers (huge magical venomous snakes), hostage rescues: it’s all in day’s work for these teenagers. Their encounter with the huge lochness monster, who lurks, troll-like, under a bridge and snatches unwary people who cross its bridge without paying the traditional toll, was one of the highlights of the story. We get to know the character of the lochness, one of my favorite monsters from Cold Burn of Magic, just a little better in this final tale in the trilogy. Lila learns about the importance of respect and friendship, even toward monsters … well, excepting the copper crushers. With his black hair, bronze skin, and dark, soulful eyes, Felix was undeniably cute, but Devon was the one who made my heart race like a tree troll hopping from one branch to another. Erneut geht eine Reihe zu Ende, bei der ich eigentlich ganz froh darüber bin. Während mir der erste Band noch richtig gut gefallen hat, konnte mich die weiteren leider immer weniger überzeugen. Was vor allem daran lag, dass es mir zu übertrieben bzgl. Lila wurde. Wie auch hier in diesem Teil. Okay, wie ihr seht habe ich schon diese Aktion etwas lächerlich und unrealistisch empfunden, aber das war leider nur ein Tropfen auf dem heißen Stein. Und wie gesagt, außerdem fand ich es etwas lächerlich, dass alles nur durch eine Jugendliche gerettet werden kann. Sei es nun die Sinclairs aus den Händen der Draconis zu befreien oder später bei dem Endkampf, bei dem Lila antritt, anstatt irgendjemand der zig Kämpfer/ Wächter/ Bodyguards die Claudia in ihrer Mafia-Familie beherbergt. Das Beste war dann auch noch, das Devon meinte: Ja klar, mach nur, ich weiß, dass du das machen musst! Warum auch nicht? Ist ja nicht so, dass er sie liebt und nicht will, dass sie vor seinen Augen getötet wird. Er ist eben ein verständnisvoller Freund, daher kam es kein einziges Widerwort. Wow, ich glaube, in diesem Moment habe ich ihn mir als Strohpuppe vorgestellt. Vielleicht schön anzusehen, aber kein Leben in ihm. Ihr fragt euch jetzt, warum es dennoch noch 3 Punkte gibt, obwohl ich hier leider hauptsächlich nur Kritik geäußert habe? Nun ja, zum einen, weil ich den ersten Teil richtig toll geliebt habe und hier Wehmut mitschwingt. Und auch, weil die Grundidee von Estep wirklich klasse, frisch und unverbraucht war und manche ihrer Einfälle zu den kleinen Monstern oder zu den Pixies und andere Sachen waren richtig, richtig toll. Nur hat es für mich leider oft an der Umsetzung bzw. den Figuren gehapert. Schade, aber ich denke, in Zukunft bleibe ich ausschließlich bei ihren Erwachsenden-Büchern von Estep. Roll up, roll up its time to enjoy all the fun that the town of Cloudburst Falls offers. It's the most magical place in America and the tourists flock there in their droves. It could be the non stop entertainment with those who work for the ruling families strutting their stuff. Who wouldn't ooh and aah at guards wearing capes and plumage looking like something from an Alexandre Dumas novel. There are souvenirs aplenty but perhaps what really brings out the curious is the fact that Cloudburst Fa Roll up, roll up its time to enjoy all the fun that the town of Cloudburst Falls offers. It's the most magical place in America and the tourists flock there in their droves. It could be the non stop entertainment with those who work for the ruling families strutting their stuff. Who wouldn't ooh and aah at guards wearing capes and plumage looking like something from an Alexandre Dumas novel. There are souvenirs aplenty but perhaps what really brings out the curious is the fact that Cloudburst Falls is the home of the monsters! Yes look up and you might spot a tree troll cheeping away above you . If you are really brave then how about a trip to the river to perhaps spot the loch ness that resides there. Oh but then of course there's the truly evil monster that lives there but he isn't the usual monster no Victor Draconi is head of his family and determined to take over all the other families! Lila Merriweather knows just how evil Victor is as he slaughtered her mother. Now four years later she works for the Sinclair family. Lila has found a home , purpose, friends and maybe even love but knows full well that unless someone stops Victor all that might be lost forever. Victor has amassed a stock pile of vicious black blades but Lila is on to him and determined to prevent him using them but is she too late? I love this series which is suitable for young adults . It's set in the same world as the authors Elemental Assassin stories and we even get nods to the infamous Pork Pit which always makes me smile . Lila has gone from being a wary outsider to someone who has let people in and I loved that her character was allowed to grow . As a villain Victor is truly evil and doesn't care who his actions hurt. You just know that he deserves to fall but can anyone really be stronger than him? Victor is probably the most powerful magic user but Lila has a few trucks up her sleeve and 'friends ' to back her up. There's plenty of action here but I was surprised at the juggernaut pacing as I'd hoped for another book. Alas I fear this might be a trilogy so sadly might have to say goodbye to these wonderful characters . I've never understood the term book hangover until now and now sadly I do. Fast paced, inventive and alas for this reader addictive. Seems my ratings for these books are going to be inversely proportional to the book's position in the series. Put simply, as the number of books increase, the number of stars decrease. There is some good in this book...300 people have rated it 4 or 5 Stars and I get it. I understand why they love it. But it was driving me to distraction. The author often repeats adjectives and adverbs for emphasis. It's her style. It's all about his "green green eyes" or the "cold cold burn" or my "black black h Seems my ratings for these books are going to be inversely proportional to the book's position in the series. Put simply, as the number of books increase, the number of stars decrease. But it was driving me to distraction. The author often repeats adjectives and adverbs for emphasis. It's her style. It's all about his "green green eyes" or the "cold cold burn" or my "black black heart". Personally I find it annoying but have managed to forgive / ignore it in her Elemental Assassin series. Not so easy to ignore in this book. Another thing which made me want to bang my head against a wall was that characters would be just about to be attacked by the bad guys and they would launch into these long emotional farewells, or they'd be rescuing friends and rather than getting on with it they'd stop for a chat. I don't mind a chat but seriously there's a time and a place. And finally, the tone of the book is just too ponderous for the subject matter. Doom, doom doom, gets old quickly. There really needs to be a lightness as a counterpoint, it was there in book one with Lila stealing the Sinclair Family silver, with the tree troll hurling rotten fruit at passers by, and with Lila's red-neck Pixie. It's all but disappeared in this one. War ein guter Abschluss der Reihe, allerdings sehr vorhersehbar. Aber ich mochte die Charaktere und den Weltenentwurf ganz gerne. Von der Story her aber eher durchschnittlich. Well Done Jennifer Estep! Well Done! This final book in the trilogy did what many YA trilogies failed to deliver: A Thrilling and Satisfying Conclusion. This third book started with the head of the Family, Claudia Sinclair and her son Devon, the family Bruiser working with the family bodyguard Lila Merriweather, and Lila’s cousin Deah to foil Victor Draconi’s plot to control the town of Cloudburst Falls. If you read books 1 & 2, you know the significance of this alliance and how it came to be. *Hint* Read this series in order to fully comprehend the minutiae. The action and power struggle began immediately as the line in the sand was drawn between the Sinclair Family and the Draconi Family with the other families trying to pick the winning side. What I loved most in this story was that Lila and Devon’s romance to a back seat to the family business as it rightfully should have. The Sinclair family was united and focused on the preparation for the Draconi family move, whatever it maybe. While love young love as blossoming, the priority was saving lives. Lila is one of my favorite YA heroines. She is tough, resilient, smart, noble and resourceful. Now that she found a new home with the Sinclair family, she was putting her life on the line to protect them from the Draconi threat. Devon was brave as was all the supporting casts fighting on the side of good. The author did a fantastic job keeping the story adrenaline-charged and interesting. This was a quick paced story with an engaging plot that flowed and was congruous to the theme started in book 1. The world building was complex enough without being too dense and boring. The supernatural creatures were different from the norm and there wasn’t too many of them to overwhelm the story. The final showdown allowed Lila to address a wrong committed against her family both from the past and in their current situation. Then ending was well thought out and satisfying. I highly recommend this series to those readers looking for an entertaining YA urban fantasy with a light romance. 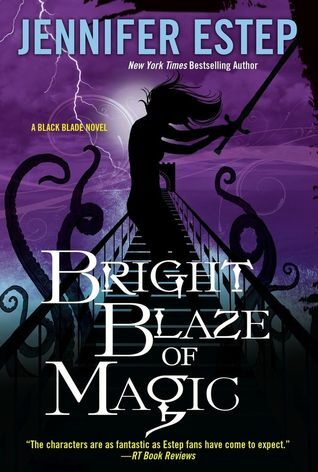 Jennifer Estep had a lot of ground to cover in order to tie the BLACK BLADE trilogy up with a nice bow what with the main story arc, romance, and Lila’s past still up in the air, but rest easy because all that and more was accomplished in BRIGHT BLAZE OF MAGIC. This series is intended for a Young Adult audience, and yet the Urban Fantasy elements were just as strong that regardless of your preference, you’re sure to enjoy this novel. The finale set-up has been two installments in the making, so this title was about watching the author free the pent-up momentum, and letting her rip. The book does begin with Merriweather, Devon & Felix enacting the last stages of their plan, however after that it’s a straight shot to the conclusion. Relations between the Families enter the red zone, Victor Draconi makes his move, and the Sinclairs meet him pound for pound. Lila’s mother played such an important role in her life, and continued to do so well after her death. I liked how the heroine was able to hold-on to her memory, and honour Serena’s legacy by finishing what she had set in motion four years ago. The way that the events unfolded had a cool fate-like feel to it, and we also got to learn about Merriweather’s father who hadn’t been mentioned overly much up until this point. The death toll was higher than what I’d envisioned, minus most of the gore found in Estep’s adult works, but given that an all-out mafia war broke out, I thought that it was appropriate. The tête-à-tête between the Draconi head and Lila had just the right amount of fingernail biting moments too. The love interest with Devon was handled in a tasteful way, and I was happy that a second couple was able to get their own HEA as well. Ich muss nicht vie über ein Buch sagen, dass ich an einem Tag komplett durchgelesen habe, oder? Die ganze Trilogie war toll, ich mag Lila sehr, auch wenn sie teilweise echt ein Brett vorm Kopf hat (Ich sage nur: Wölfe, Blitze, etc). Eine ganz tolle Welt, die Jennifer Estep da aufgebaut hat und die ich unbedingt weiterempfehlen kann! (Allerdings... Wenn ich noch einmal das Wort "rumschieben" lesen muss, dann verzweifel ich. Da muss es doch bessere Begriffe für geben. Würde mich ja mal i 4,5 Sterne. I should start by confessing I'm not an overly enthusiastic fan of YA. 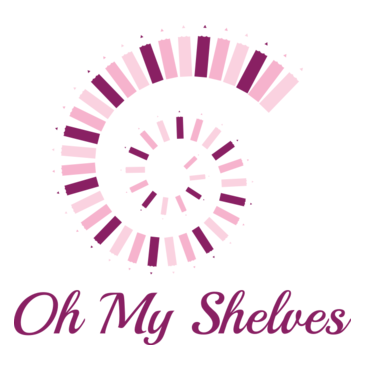 In fact I only follow a (very) few YA series. However, the moment I read Jennifer Estep's Black Blade series I absolutely fell in love with the world & characters. I suspect the fact it's clearly UF with all the usual elements helps. I find most YA loses any "edge". I especially enjoy reading the story from Lila's POV. She's courageous, intelligent, virtuous, & I happen to think her astonishingly entertaining. Her romantic interest Devon Sainclair (Sainclair bruiser) is an absolutely perfect match for Lila. I find their dialogue incredibly sweet & feel the progress made with in their relationship believable. I especially like the fact they didn't have any insta-love. This is a complex world with many different species. Estep does an excellent job explaining every aspect sufficiently without massive info dumps. In truth the world building is seamless. The romantic story arc continues its forward momentum at a steady pace. The altercation between the Sinclair & Draconi households reaches it's much anticipated conclusion. I found the battle was filled with surprises, had plenty of action, & was well written. Yes, I would definitely recommend this series to readers looking for a YA novel without the common plot predictability, dreaded instal-love or a heroine who suffers from TSTL. I find myself engrossed in the world, plot, characters, & happily exercising my suspense of disbelief. I encourage you to give this series a try. 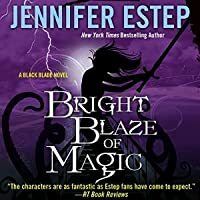 eARC Bright Blaze of Magic by Jennifer Estep kindly provided via Netgalley in exchange for an honest review. Handlungstechnisch geht es heiß her, und ich war sofort wieder in der Geschichte drin. Estep hat es einfach drauf, wie ich nicht müde werde zu betonen. In diesem Band gibt es sehr wenig 'Verschnaufpausen' für Lila & Co. und es kam mir zu keiner Zeit Langeweile auf. Die Entwicklungen gefielen mir sehr, und am Ende wurde es nochmal richtig spannend. Der Showdown der Trilogie kann sich auf jeden Fall sehen lassen. Der Schreibstil liest sich wie gewohnt sehr flüssig und schnell. Die Kapitellänge ist sehr angenehm gehalten, mir war zu keiner Zeit langweilig. Der gewohnte Mix aus Action, Liebe, Humor und Story spricht mich einfach an und macht Spaß zu lesen. Auch die Charaktere gefallen mir wieder. Lila ist und bleibt für mich eine angenehme Persönlichkeit. Zwar mit Gefühlen, aber kaum am Rumheulen. Sie ist schlau, ganz gut im Kämpfen. Auch die übrigen Charaktere - Devon, Felix, Julia und Elfe (und natürlich noch viele mehr) sowie natürlich die Antagonisten - überzeugen mal wieder auf ganzer Linie. Kritik ist und bleibt leider, dass sich Esteps Reihen bei genaurem Hinsehen sehr ähneln - wobei die Ideen/Wesen/Welten immer etwas Besonderes sind. Auch fiel mir auf, dass manchmal, wenn Lila jemanden tötete, es schön umschrieben wird, z. B. dass sie ihn nur 'ausschaltete' anstatt abstoch. Dennoch überwiegt das Positive der ganzen Reihe natürlich - und Lesespaß ist garantiert. Schlussendlich bleibt mir nur zu sagen, dass Estep ein wundervoller, der Reihe würdiger Abschluss gelungen ist. Allgemein kann ich die Black Blade-Trilogie allen Fans von Urban Fantasy und Jugendbuch-Lesern empfehlen, die es gerne humorvoll, originell und auch mal brutaler mögen. Vielen lieben Dank an den ivi Verlag für das Rezensionsexemplar! Lila and the Sinclairs f Bright Blaze of Magic is the final book in Jennifer Estep’s Black Blade trilogy. It continues in the same tone as its two predecessors, which means that it’s exciting, entertaining, and very easy to read. I have always admired Estep’s style precisely because it’s so easy to absorb. Her writing is as far from frilly as you can get – it is, I dare say, functional – but it serves her well and it doesn’t draw attention away from her stories, which is the most important thing. Third in the Black Blade young adult arcanepunk series and revolving around Lila Merriweather — it's quite personal, as it's first-person protagonist point-of-view from Lila's perspective — in the Disney-like Cloudburst Falls, West Virginia. It doesn't take long before I started questioning the intelligence of the Sinclairs. They know what Victor is planning, in general, and they don't realize what those possibilities are? They narrow down the location of the prisoners but wait? They don't Third in the Black Blade young adult arcanepunk series and revolving around Lila Merriweather — it's quite personal, as it's first-person protagonist point-of-view from Lila's perspective — in the Disney-like Cloudburst Falls, West Virginia. It doesn't take long before I started questioning the intelligence of the Sinclairs. They know what Victor is planning, in general, and they don't realize what those possibilities are? They narrow down the location of the prisoners but wait? They don't scout? Ever? Lame, lame, lame. Estep takes on the trope in which we're supposed to think the bully is being swayed. But none of it rings true. As for those excuses as to why the Draconi employees don't leave an employer they disagree with?? If ya don't like it, you leave. Estep doesn't give us any reason as to why these people wouldn't leave Victor. Although, why would anyone trust the Draconi guards? Then Estep follows up with the I-can-become-powerful-when-an-innocent-is-attacked ploy. Oy. Then she's losing the battle…because she's not thinking. Again. For all of Lila's boasting and abilities, she's still untried in true battle. Allowing your anger to rule? What had her mother been teaching her? Dang, Estep slipped in a reference to the a Pork Pit…and now I want barbecue! Two of the few scenes that made sense included Lila's realization about the bloodiron and finally accepting her abilities to the full. Oh, dang, that's not fair. Most of the story was fine, if too padded and slow, but those negatives really stood out. More detailed back history on why Serena got on Victor's "naughty" list. *More laughter* with how Estep pulled in the titles in Black Blade: "That cold burn of magic filled my veins…", "…there was just a bright blaze of magic..", "…cold burn of magic in the air…", "…the cold burn in my veins had nothing to do with magic…", and "…straight through the heart with a black blade". Okay, so Bright Blaze of Magic annoyed me. Still, I am curious as to where Estep plans to go after this one. She's certainly left it open for possibilities. Lila (Sterling) Merriweather, with her transference, soulsight, and ability to see everything with crystal clarity in the dark Talents, has gone to work for the Sinclairs, as a sword-wielding bodyguard to Devon. Her mom has taught Lila the old ways. Oscar is the cowboy boot-wearing pixie who takes care of Lila. Tiny is his pet tortoise. Luke was Lila's father and had been the Draconi family bruiser when he fell in love with Serena. …similar to the Mob, a magical one, and they run Cloudburst Falls, dividing the Midway up between them. Devon Sinclair is the family bruiser with compulsion Talent and in love with Lila. Claudia, a.k.a., the Ice Queen, is his mother with the Talent to freeze, the head of the family, and had been best friends with Serena, Lila's mom. The overly chatty Felix Morales has healing magic like his dad, Angelo. Mo Kaminsky runs a pawnshop, the Razzle Dazzle, and has cared for Lila since her mother was murdered. He's also the Sinclair Family broker, having taken over from Grant Sanderson in Cold Burn of Magic , 1. William Reginald is the family butler. Charlie had worked for the family for the past ten years. …founded Cloudburst Falls. Victor Draconi is the psychopathic head of the family and the sworn enemy of the Sinclairs. Blake is the family bruiser. Deah is Victor's daughter and Lila's cousin; she has mimic magic and is in love with Felix. Seleste Sterling Draconi is Victor's second wife with foresight and strength Talent. Nikolai Volkov is the head of the family. Katia had become addicted to power and killed to get it in Dark Heart of Magic , 2. Poppy is a friend and in training to become the family broker. Her father, Hiroshi, is the head of the family. Julio wants a re-match at the next Tournament of Blades. Roberto is the head of the family. Bloodiron is a metal that can store, absorb, or transfer magic. Pixies like to keep house, cook, clean, etc., in exchange for a safe place to stay. Tree trolls like chocolate. The lochness patrols his bridge and expects toll to be paid. Copper crushers are one of the worst monsters with their venom and crushing strength. A family Bruiser is the second-in-command and responsible for defense. A family Broker handles the finances. A family Butler oversees the house and everyone in it. The cover is a bright purple violet with swirls and lightning. Lila is on a long, narrow bridge, slashing away with tentacles rising up from the foamy light blue water. The author's name is in the same light blue and embossed at the top. The title is an embossed white and blazes across the bottom half. Series information is in a tiny yellow just above the tentacles on the left side. I am almost embarrassed to admit that this is my first Jennifer Estep book. It sure as hell won't be the last. When I got approved for this on Netgalley I fully intended on reading the first two books in the series, but I just didn't have time. I worried that I wouldn't be able to follow the story but major kudos to the author for skillfully blending reminders of what had happened previously, along with detailed explanations of the s Enthralling, engrossing read that had me riveted from page one. I am almost embarrassed to admit that this is my first Jennifer Estep book. It sure as hell won't be the last. When I got approved for this on Netgalley I fully intended on reading the first two books in the series, but I just didn't have time. I worried that I wouldn't be able to follow the story but major kudos to the author for skillfully blending reminders of what had happened previously, along with detailed explanations of the setting and plot which ensured I seamlessly picked up on the story. That said, I really want to read them now! I want to see how Devon and Lila's relationship developed from their first encounter. The romance was a little light for me, but that's just personal preference. I love the romance arc to occupy a bigger chunk of the plot. All in all, this was a fantastic read, and I look forward to checking out more of this author's work in the future. Third book in this series ends in an adrenaline pumping conclusion. Lila is working secretly to destabilize Victor Draconi's plan to take over all the families. With the help of the other Sinclairs and secret relatives, she is so close in completing her mission. This story moves at a fast pace as Lila's past with the Sinclairs and Draconi are revealed. It seems that history is about to repeat itself and Victor will not be a happy man. This story is filled with ruthless killing and families torn a Third book in this series ends in an adrenaline pumping conclusion. Lila is working secretly to destabilize Victor Draconi's plan to take over all the families. With the help of the other Sinclairs and secret relatives, she is so close in completing her mission. This story moves at a fast pace as Lila's past with the Sinclairs and Draconi are revealed. It seems that history is about to repeat itself and Victor will not be a happy man. This story is filled with ruthless killing and families torn apart. The black and white in this story as far as good versus bad is interesting because the Draconi believe people are either with them or against them. No one is allowed to sit on the fence. When there are those who do not want to be involved or are torn between family and what they feel is right, where do these people fall? They are what Ms. Estep likes to call, collateral damage. The guerilla warfare tale with Lila leading her team of rebel fighters contains all the hallmarks of a great young adult tale. There is an underdog hero, a quest, a love interest and a wicked overlord to overthrow. Throw in the murdered parents, star-crossed lovers and betrayal, what does this series not contain? It does not contain enough about the different creature. Whilst I enjoyed Lila and her fighting on the side of right, what I really liked was all the different creatures in this world. I wish to learn more about them. It is as if Ms. Estep hints at this hidden world filled with mystery and deeper meaning, but she whisks it away before we can learn more. Frankly, I could care less about the humans. I want to learn about the so called monster in the river. I want to know more about the different creatures that go bump in the night. Will Lila be the creature whisperer? Overall, this story is well written and transports a reader into a dark alternate reality. This magical book is recommended for young-adult readers who enjoy strong female characters who do the right thing. Bright Blaze of Magic is the 3rd book in Jennifer Estep's new series Black Blade. The series takes place in Cloud Falls, a magical town not far from Ashland. In fact, for those familiar with Estep's Elemental Assassins series, there are a few little shout outs to Gin's restaurant. The story is told from the point of view of Lila, a thief with some very useful magical talents. Lila works for the Sinclair family. Cloud Falls is run by various mob families, the Sinclairs and the Draconis being the Bright Blaze of Magic is the 3rd book in Jennifer Estep's new series Black Blade. The series takes place in Cloud Falls, a magical town not far from Ashland. In fact, for those familiar with Estep's Elemental Assassins series, there are a few little shout outs to Gin's restaurant. The story is told from the point of view of Lila, a thief with some very useful magical talents. Lila works for the Sinclair family. Cloud Falls is run by various mob families, the Sinclairs and the Draconis being the dominant families. And what a town it is. There's a midway for the rubes (or tourists) guarded by the families because off the beaten tracks are all sorts of magical monsters. I've enjoyed Ms. Estep's writing style for a few years now. I read each new book with anticipation. A word of warning - don't read her books when you are hungry. Her descriptions of food make my mouth water. Is it ever easy saying goodbye to a series, to its characters that you have come to know, love, and even call friends? No matter how exciting it is to get to that last book, to see it all come together, and come to an end, it is always bittersweet as well. This last installment did not disappoint. I completely loved it and it stuck to the feel of the other books, both plot wise and character wise. And I have to give a big woo hoo for the Pork Pit shout out in it, I totally loved it and it made me Is it ever easy saying goodbye to a series, to its characters that you have come to know, love, and even call friends? This last installment did not disappoint. I completely loved it and it stuck to the feel of the other books, both plot wise and character wise. And I have to give a big woo hoo for the Pork Pit shout out in it, I totally loved it and it made me grin like an idiot. Estep knows how to write and how to end her series. I never worry about what will happen because I just know it will be all for the best and do the whole series justice. I have absolutely adored this series from the first book and am so happy with the way it all came together for Lila, Devon, Felix and the lot of them. This was such a fun series and as sad as I am that it is all over, I'm also left very satisfied with it too and really, you can't ask for more than that. "Die helle Flamme der Magie" ist Jennifer Esteps dritter und letzter Band ihrer "Black Blade" Jugendbuch-Fantasy Triogie. Wie auch bereits die Vorgänger konnte mich auch das letzte Buch über Lila Merriweather begeistern. Was heißt begeistern? Jennifer Estep hat es erneut geschafft mich vollends zu verzaubern. Sie schafft es mit jedem ihrer Bücher mit in ihre Welt zu ziehen, mich in ihre Charaktere zu verlieben, jede einzelne Zeile aufzusaugen und die Zeit zu vergessen. Bereits ihrer erste Jugend "Die helle Flamme der Magie" ist Jennifer Esteps dritter und letzter Band ihrer "Black Blade" Jugendbuch-Fantasy Triogie. Wie auch bereits die Vorgänger konnte mich auch das letzte Buch über Lila Merriweather begeistern. Was heißt begeistern? Jennifer Estep hat es erneut geschafft mich vollends zu verzaubern. Sie schafft es mit jedem ihrer Bücher mit in ihre Welt zu ziehen, mich in ihre Charaktere zu verlieben, jede einzelne Zeile aufzusaugen und die Zeit zu vergessen. Bereits ihrer erste Jugendbuch Reihe "Mythos Academy" hatte diese fantastische Sog-und Suchtwirkung. Natürlich steigert diese Faszination, an Jennifer Esteps Büchern, die Erwartungshaltung ins Unermässliche und legt die Messlatte für ihre Neuerscheinungen unendlich hoch. Gerade aus diesem Grund ist es unglaublich, unfassbar, dass die Autorin auch mit diesem Buch wieder voll und ganz überzeugen und meinen Lesegeschmack treffen konnte. Die 17-jährige Lila Merriweather konnte sich gleich von der ersten Zeile in mein Herzchen stehlen. Lila hat sich aufgrund ihrer düsteren, absolut unrosigen Vergangenheit hinter einer Mauer aus Schlagfertigkeit, Selbstironie, Arroganz, Zweifeln versteckt und ihr einziger Gedanke hat der Rache gegolten. Aber mit und mit kommen ihre wahren Gefühle der Einsamkeit, und das Sehnen nach Freundschaft, Liebe und Anerkennung ans Licht. Lila wird weich, ihre Freundschaft zur Familie Sinclair lässt sie emotional werden, verleiht ihr aber auch mehr Stärke, da Menschen hinter ihr stehen, die sie lieben, unterstützen und auffangen können. Besonders ihre tiefgehenden Gefühle zu Devon Sinclair, zu dem sie sich bereits in Band 1 hingezogen fühlt, lassen jedes Romantikerherzchen schneller schlagen. Aber genau diese Verletzlichkeit lässt sie absolut menschlich erschienen und genau aufgrunddessen muss man sich als Leser auf jeden Fall in sie als Protagonistin verlieben. "Bad things always comes in threes"
At the beginning of Bright Blaze of Magic I was sooo sure this was going to be a 5 star. The story started around two weeks after the events of book two, with the typical funny trio Lila, Devon and Felix. The story pace was so fast, and after only 30 pages the story had his first pang and I was sitting on the edge of my seat, eager to read and read and read .... but then, the story got kind of ... stupid. Yep, stupid. Lila (and Deah) acted like total idiots, Lil "Bad things always comes in threes"
Further, at the end Lila was too overpowered. I'm used to teenagers, who save the world on their own (Shadowhunters) but this ... ugh. Accordingly, the ending was not my type. Nevertheless, I really did like the books a lot, and despite of my critics, I still liked the conclusion of the story. Ich liebe Jennifer Esteps Schreibstil, dennoch war dieser Band fuer mich leider der schwächste in dieser Reihe. Ich mochte die Story an sich, aber vieles war mir zu übertrieben und unrealistisch und es gab an mehreren Stellen kleine logische Fehler. Dennoch mochte ich die Reihe insgesamt sehr gern. Now, that is how you wrap up a series! I always have really high expectations for the final book in a series, and I am so happy that this book lived up to my expectations. The small issues I had with the previous books were either resolved or nonexistent in this book. I honestly don't have anything to complain about. I loved everything about this book. I think my favorite thing about this book was the nonstop action. There was always something going on that had me on the edge of my seat. This boo Now, that is how you wrap up a series! I think my favorite thing about this book was the nonstop action. There was always something going on that had me on the edge of my seat. This book was thrilling! Jennifer's action scenes were so detailed that I could clearly picture each moment in my head, which I sometimes have a hard time doing. Jennifer's writing skills really shined in this book. The characters were as awesome as always. I grew attached to a lot of the characters in the previous books, and I loved being reunited with them. Devon, Lila, Felix, and Deah are definitely my favorite characters from this series. They are all so unique and they each add something special to this series. Lila definitely was my favorite character. Lila was kind, loyal, funny, strong, resourceful, and so much more. I loved how she could stand up for herself and she didn't need anyone to rescue her. She had people who supported her and helped her, but she was never a damsel in distress. The romances in this book were perfect. I loved all of the couples, and I ship them so hard. None of the couples had insta-love. Each romance developed at a slow and believable pace. The romantic gestures and dialogue all felt real and so sweet. I can't properly put into words how much I adored the couples in this book and series. This book was a thrilling and action packed adventure. With touches of romance, humor, and mystery, there was nothing else I could have asked for from this book. This book will not let fans of this series down! On the fence, I guess? 3.5 for now. Lila Merriweather is now a full-fledged member of the Sinclair Family and has discovered her relationship to the Draconi’s. Determined to stop Victor Draconi from killing the Sinclairs and other families in order to take over as the ruling family of Cloudburst Falls, Lila, along with friends, has been slowly working behind the scenes to keep that from becoming a reality. When the scions of the various families are kidnapped and held for ransom, Lila will have to use everything in her arsenal to save the young man and the people she has come to love. Bright Blaze of Magic is the third and final installment in Estep’s YA based urban fantasy trilogy. Our heroine, Lila Merriweather has gone from an orphaned loner to a girl with a family, a boyfriend, and a mission to avenge her parent’s death. Estep has done an admirable job of leading us to this point; setting up the plotlines, slowly allowing her heroine to grow, and making sure readers have all the information needed as she starts this book off with a bang and give us a respectable ending. Steady pacing, engaging dialogue, and action-packed scenes kept this reader entertained as Estep revisits the most magical place on Earth for the final showdown. I enjoyed seeing Lila finally settle into her role and accept the bounty she originally rejected. The storyline is pretty straightforward without any real surprises or plot twists. 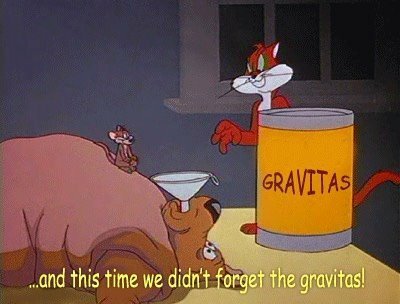 The foreshadowing is laid on with a heavy hand. As I stated earlier, Estep pretty much tells us what is going to happen in book two and in here we see how it plays out. Punches aren’t pulled as Estep stays true to her heroine, allowing her to learn with each new hurdle she is forced to jump though there is no doubt at all Lila will prevail. The cast of secondary characters continues to entertain and add to the anticipation of the story. Everyone puts aside their differences in a great show of solidarity for the common good. Lila gets help from the most unexpected places as she prepares for the coming battle through I was a little disappointed by everyone’s obvious regulation to minor supporting roles.These characters have lived and trained for the fighting and skirmishes between their families yet they all back down and place their future in the hands of a seventeen-year-old. I was expecting more from them. I was also disappointed with the development of Victor Draconi. He didn’t live up to his hype from the previous books. We are informed this is an evil black-hearted villain yet for all his posturing he was nothing more than a mashup of ridiculous threats and loosely plotted avenues of destruction. Estep tightens up all the loose ends and wraps everything up in a fight to the death that resolves the main conflict but leaves some small openings that could spell more visits to CloudBurst in the future. Overall I did enjoy this series though it is definitely geared towards a younger reader. I recommend it for all readers who enjoys an adventurous YA Urban Fantasy with a lightweight world filled with magic, and a strong relatable female protagonist for readers to cheer for. I really had fun while discovering the first two volumes and it is true that I was really looking forward to be able to immerse myself in this third one. I can also tell you that I was completely carried away by all what the author has presented! A great volume again. We thus find our heroine launched on new adventures and I must say that it will take her courage because she will literally see all the colors! Indeed, it seems that Victor has finally decided to hit hard to take the lead of all families. 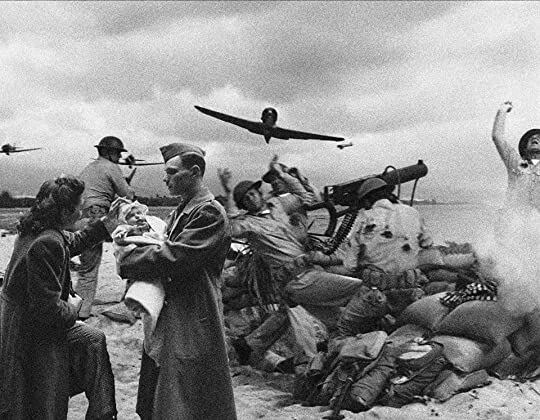 Fortunately for them, our heroes had anticipated this attack to limit the effects but it does not change the terrible consequences that will occur. It was fascinating to see our heroes coming together to try to save their friends, and it will not be easy, that’s for sure. Lila will be the brain of the group and the main target of the Draconi with Devon. I was really excited to see how everything would unfold, how our heroes would be able to get by, to understand the designs of Victor, to see how Lila would be able to release all these people she loves. Many important events are presented here and I admit that what intrigued me most was the interaction of our heroine with the monsters of her city. It’s quite touching to see the confidence she has in them, to see that she knows them better than anyone and finally that they can also be there for her. It really is a very good novel! I do not know if this volume is the last one, but if this is the case the author has perfectly managed to close her history, even if it’s true that I’d really love to have more. I was carried away from the start of the volume and that until the end! I must say that we are immersed quickly into the action and we look forward to the resolution of the story. Lila has also evolved tremendously through the books and it’s true that it’s nice to see that, her being part of something and to have friends who rely on her and on which she can count on too. Her story with Devon is also very touching! Bright Blaze of Magic was a well-developed conclusion to the overall trilogy. Readers are rewarded with answers regarding Lila’s mother and Victor’s o I was a tad nervous beginning Bright Blaze of Magic as last books tend to disappoint me but Estep delivered capturing my attention from the onset. Lila along with Devon, Felix and Deah work together to foil Victor Draconi plans to rule Cloudburst Falls. Revenge, love, magic, and promises of a final battle has me slipping into this world once again. Lila Merriweather knows what Victor Draconi has in store for all the families – especially the Sinclairs and no matter where she has to break into, what she has to steal she won’t let him get away with it in this spectacular Blade Blade novel. Visiting Cloudburst Falls right now really depends on how much excitement you can take because there is no way you can stop all the adrenaline that will swarm through your body as you join Lila, Devon and her friends in this showdown of epic proportions. Th Lila Merriweather knows what Victor Draconi has in store for all the families – especially the Sinclairs and no matter where she has to break into, what she has to steal she won’t let him get away with it in this spectacular Blade Blade novel. Visiting Cloudburst Falls right now really depends on how much excitement you can take because there is no way you can stop all the adrenaline that will swarm through your body as you join Lila, Devon and her friends in this showdown of epic proportions. The story immediately steps right into some tension filled moments as Lila, Devon, Felix and Deah put their plan to thwart Victor’s evil schemes in motion and the thrills and hair-raising magical events just keep on coming from there. Monsters and magical blades add spice to the story while lots of emotional turmoil flows from the pages adding depth to the story and gripping readers by the heart. As usual, Jennifer Estep’s fascinating world is so full of vivid details that it makes readers feel as if they are right there in the middle of all the action and suspense which really keeps readers glued to the pages which is a good thing because readers sure don’t want to miss one second of this story. I hope you have kept up with Lila’s adventures so far because this one picks up where the last one left off and it just may be the best one yet, not only does it have an epic battle scene, Lila and Devon’s relationship is progressing adding the romance which I must say I was glad to see since I could just tell that they belong together. The war between the families explodes in fast paced, action packed and spine tingling suspenseful events that ensured there was no way that I could put story down once I started reading it and I really don’t think that the story could have turned out any other way and it sure couldn’t have ended any better. If you ask Lila Merriweather how she spent her summer break, she would tell you that she became a team player, made some friends, has a new boyfriend, and helped take down some bad guys. You know the typical teenager's summer. Bright Blaze of Magic was a nice wrap up of the Black Blade trilogy by Jennifer Estep. Lila gets her closer from the past and a has bright looking future with the Sinclair family. Well done Estep! I like that Lila's story was told in a trilogy, there was no unnecessary over-drawn drama that you get with some long running series. Estep gives you some fun characters, action, mystery and a little violence (I would have liked to see more blood and death but I'm a little dark that way LOL). Seriously I kept thinking "oh, this character is going to die", "this character should die" and then "finally that character died". Estep did a good job of balancing the dark with the light in Bright Blaze of Magic.